N.T. 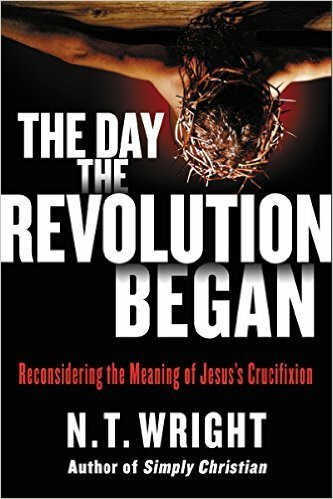 Wright’s upcoming book, The Day the Revolution Began, is an exploration of atonement. It comes out on October 11 of this year, and I was privileged with the opportunity to obtain a pre-release copy to review. Wright has a unique talent for making complex theological perspectives easily accessible for people who don’t have a Ph.D. in Theology. One of the things I appreciated about this book, from an aesthetic standpoint, is that it was well-paced and engaging. Wright works through the theme of revolution from start to finish, and it gives the book a very compelling, driven feel. I read this in the middle of a six week intensive class, and even though I was busy with assigned reading, I had a hard time putting it down. What follows this is a discussion of sin in Romans 1-2, in which Wright notes (and which is very plainly stated in Romans 1) that the traditional list of sins found at the end of Romans 1 is not so much a comprehensive list of the way people sin, but the consequences of what follows the sin of idolatry. “The primary human failure,” says Wright,” is a failure to worship.” This works its way out in the verses that follow Romans 1:21; and God’s “giving humanity over” to brokenness is, in a sense, God stepping out of the way of human decision, and allowing us to experience the consequences of our idolatry. Later, Wright frames the need for salvation (which is described in terms of the Kingdom of God rather than merely an after-death reality of heaven) in terms of the need for a return from exile, invoking the language of Israel’s history to describe the work of Jesus. Jesus’ death, then, marks the end of exile, as sin is forgiven and humanity is restored to God. Framing his argument in the context of God’s covenant through Abraham with Israel, and Israel’s sin and exile, Wright insists that the death of Jesus is substitutionary (he will describe his substitutionary atonement theory as “representative atonement”), but carefully delineates the substitutionary atonement theory that he advocates from penal substitution. Wright’s concluding chapters describe what all of this means in practical terms. Wright reminds us of the call to “take up our cross,” recognizing that victory today still comes in the way it came for Jesus – through self-denial and self-sacrificial love.